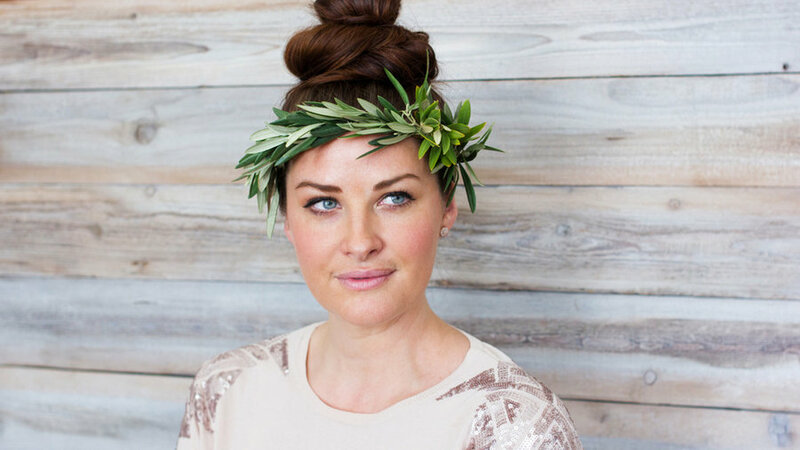 An all-foliage crown gives a sense of sophisticated elegance to your wedding look. 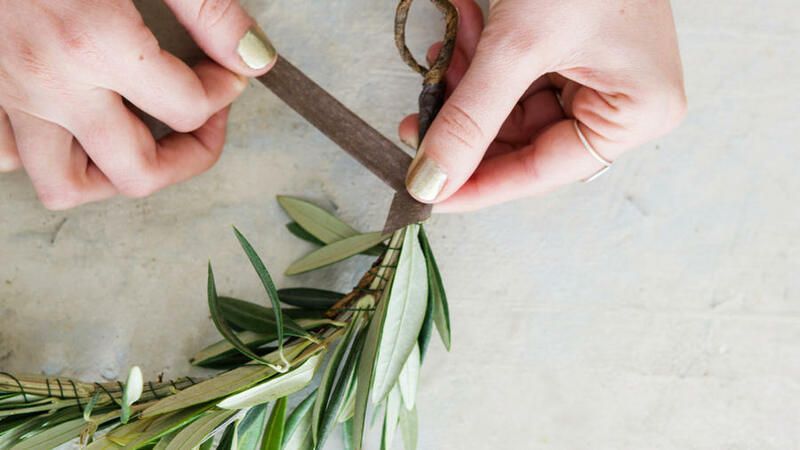 Lead floral designer of designer of Farmgirl Flowers, Rhiannon Smith, showed us how she created this beautiful accessory and offered some tips on how to make your own crown look just as stunning. 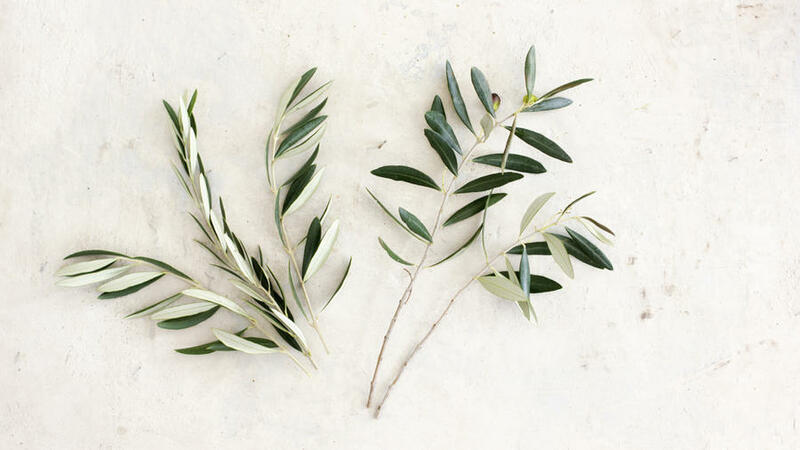 When choosing what foliage to use, Rhiannon looks for plants with sturdy stems that still have delicate leaves, such as olive, bay, or silver-dollar eucalyptus. 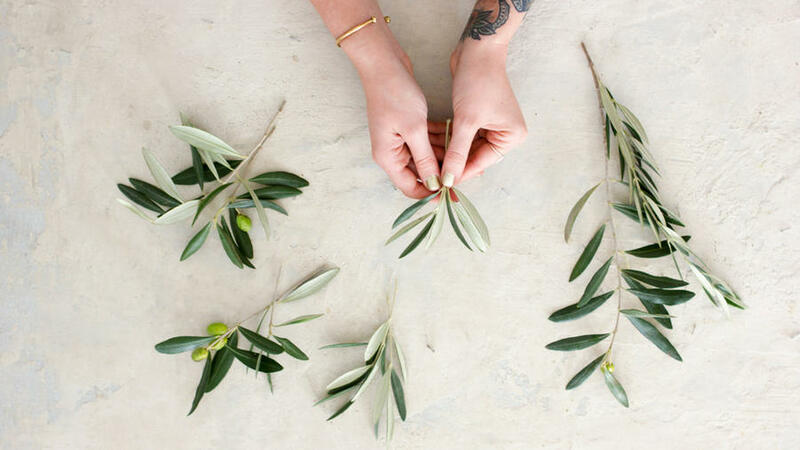 For this crown, she chose to use all olive leaves for a classic look. Assemble the crown base with a piece of grape vine wire. 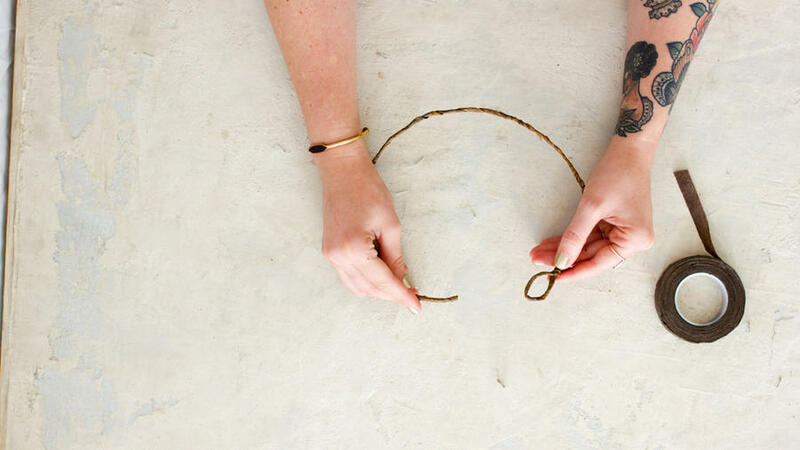 Cut the grape vine wire slightly shorter than the circumference of your head, make a small loop at both ends and wrap the grape vine in place. 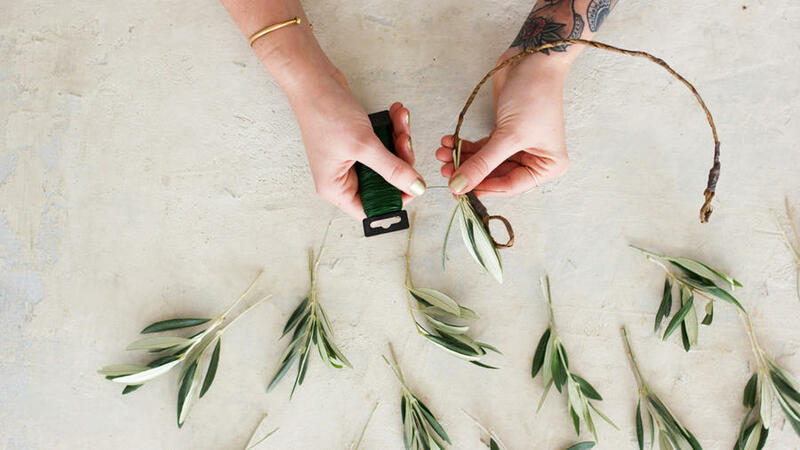 Cut your foliage in to small pieces about 2-3 inches long, removing all foliage off of the bottom inch of the pieces. 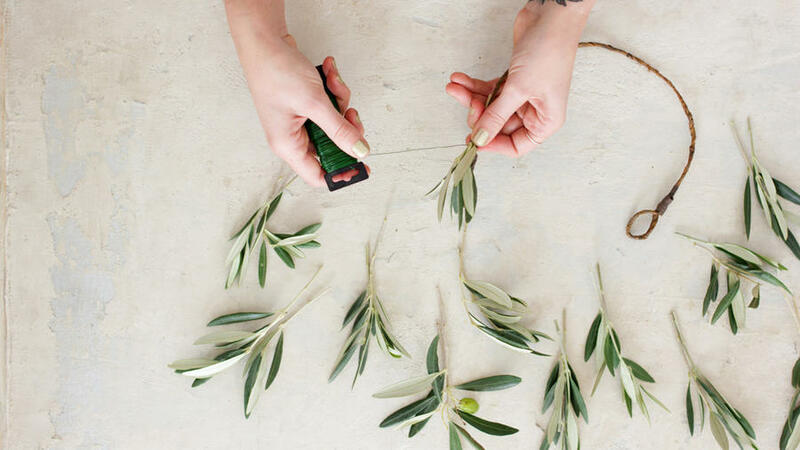 Assemble small bundles with 3 or 4 branches of cleaned foliage. You will need approximately 15-20 bundles prepared before you assemble your crown. 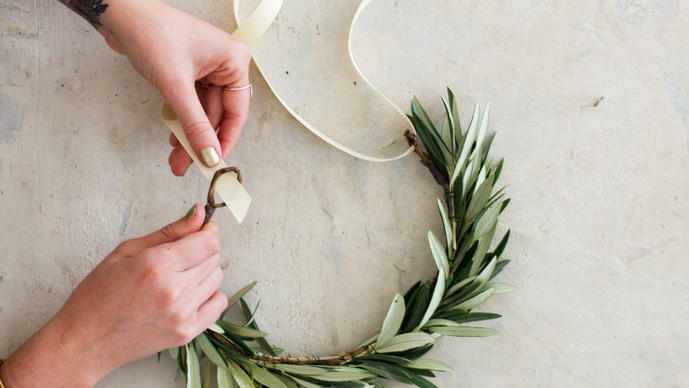 Begin building your crown by attaching a foliage bundle on one end of the grape vine base and wrap it three times with floral paddle wire. Be sure to to wrap at the bottom end of the bundle, where the foliage is removed, so your crown doesn't become too bulky. Do not cut your paddle wire until you are completely finished with your crown. Repeat this process by laying another bundle on top of the previously wired bundle. Lay all bundles in the same direction, evenly spaced for a seamless look. 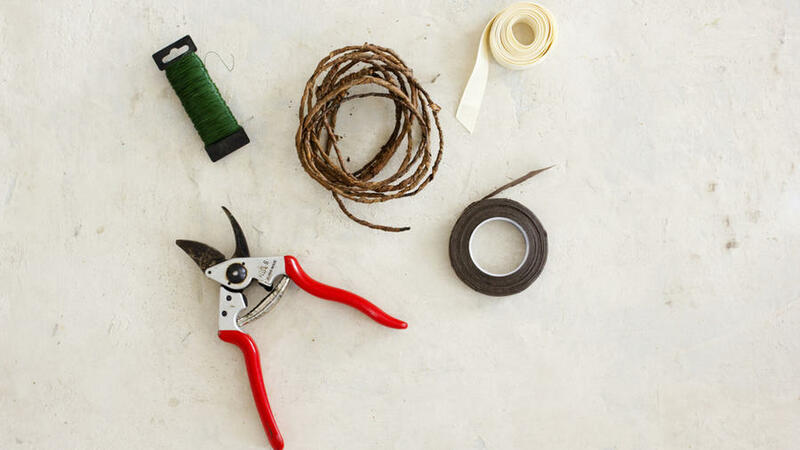 Continue adding a bundle and wiring around three times until you have completely covered the grape vine wire. Wrap the paddle wire around two extra times for security, trim the excess, and cover with floral tape. Loop a piece of ribbon through the ends of the crown base. 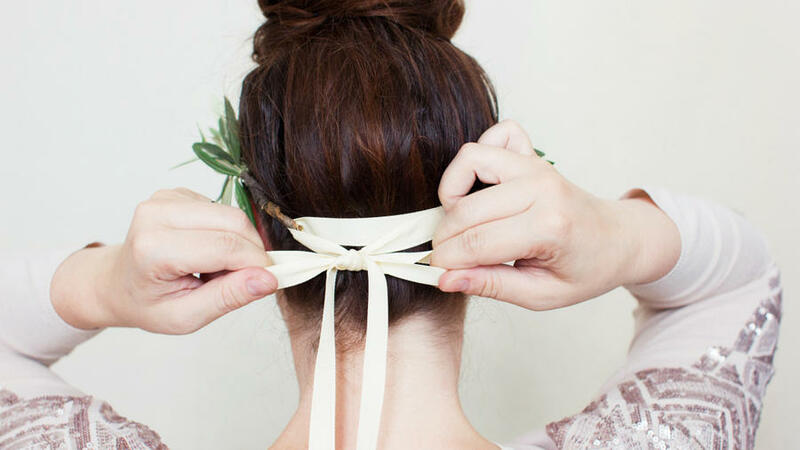 The ribbon allows the crown to be easily adjusted when tied snugly in place. Place the crown so that it sits just above your hairline. If you’re not wearing the crown immediately, mist the foliage and keep in a cool place out of direct sunlight until ready to wear.